2 weeks holiday with only a carry on? Crazy? At the end of 2012, I took a 3 week trip back to Malaysia and Australia which was my first long haul, multi-week holiday since I’d gotten back from travelling and living in SE Asia and Australia. The novelty of having (the biggest) suitcase (ever) with seemingly unlimited weight rather than a backpack, and some ridiculously last minute packing resulted in me hauling around a giant case filled with stuff I didn’t end up wearing. Combine this with a super short layover and my case not making the transfer in time (thankfully on the return trip so it didn’t matter as much), and I haven’t checked a suitcase since then. So, why would you want to travel so light? No checked bag fees – admittedly this is probably the major factor for the flights I’ve been on since 2012. If I can fit what I need in my carry on, why would I pay from £30 (low season, 15kg) to £90 (high season, 20kg) to check in the same stuff? And that’s without the crazy excess baggage fees. I’d prefer to have that to spend at my destination! No queuing to check in bags at the airport. No waiting around at the baggage carousel at your destination. No chance of your bags being delayed or lost. Less weight to drag/carry from the airport to your transport to your accommodation, and back again. This is more important if you’re using public transport or have multiple destinations. 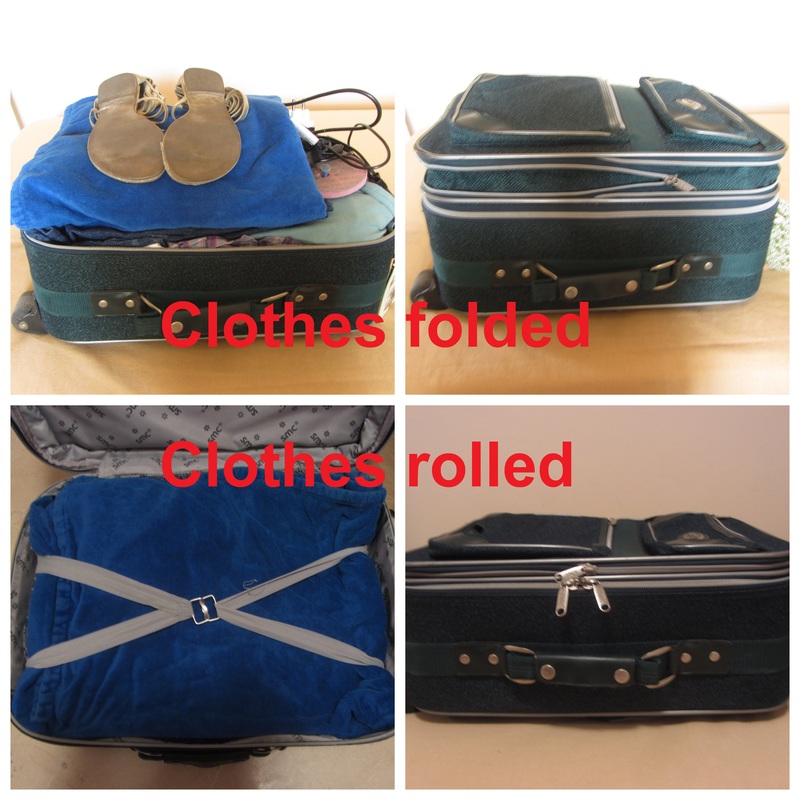 Less to re-pack at the end of your trip. Having to drag/carry the smaller case/bag throughout the airport with you. Depending on your airline, possibly not being able to have a second piece of carry-on baggage and so having to fit your handbag into your carry on case too. Liquid/gel limitations mean you may have to purchase some toiletries and sun-care products at your destination. May have to do some laundry while away. Less space for souvenirs and new purchases. 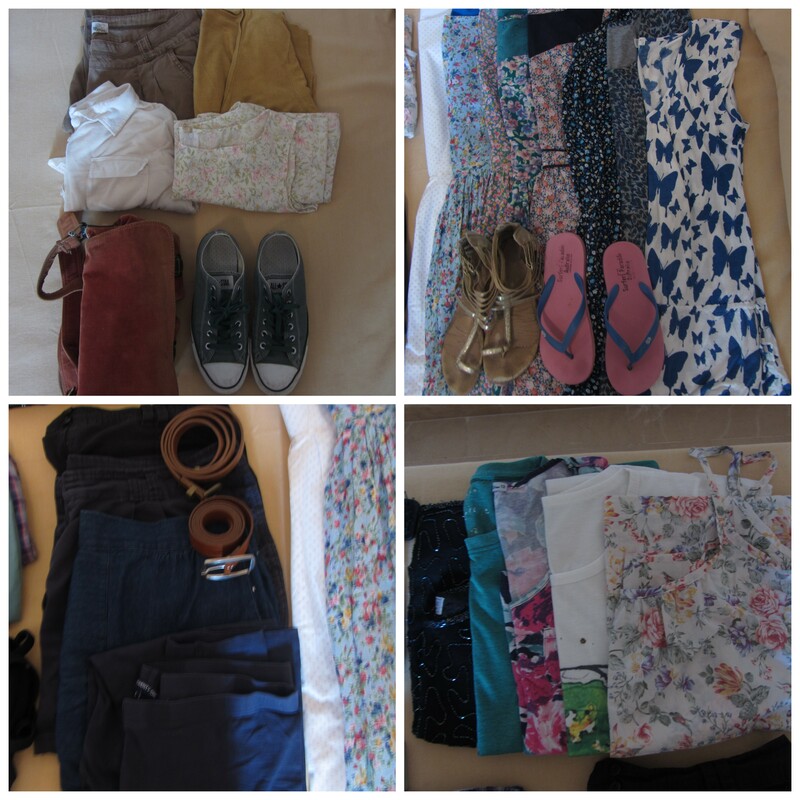 Slightly more effort involved in choosing what to pack. 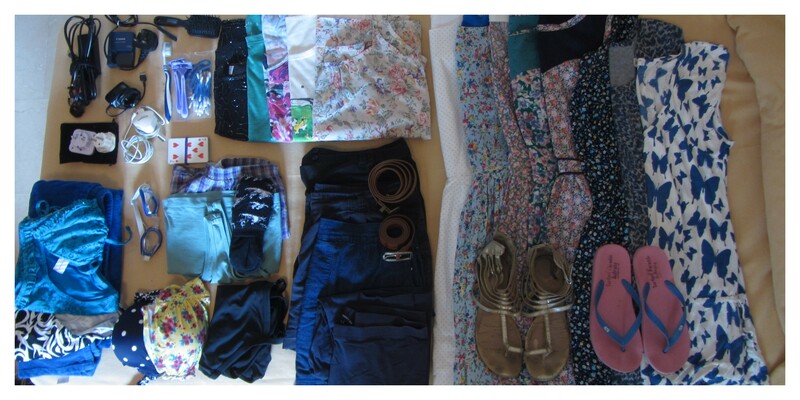 So, how do you pack lightly? Research your destination: location, climate, religious and cultural clothing etiquette. Research what activities you may do: do you need trainers, trousers, long sleeves etc? Limit your toiletries: will 100ml be enough? If not, decide whether to take 100ml bottles and buy more at your destination, or just buy it out there. Limit your make up: sample sizes or decanting into smaller pots will save space. Roll don’t fold: rolling makes a massive difference to volume. I even roll my underwear and bikinis, and then use them to fill in any small gaps. Don’t fill your case too full: leave space for any purchases on the way home, and it also seems to make the airline staff less likely to check your baggage dimensions if they are on the borderline of size limits in my experience. Choose your clothes and footwear carefully: for me, this means pulling things from my wardrobe that I could take (bearing in mind the first two bullet points) and putting them into piles (tops, bottoms, dresses, long sleeves), and then reducing each pile by trying everything on, removing similar items and making sure the majority of things mix and match. Then double check coordination with underwear and footwear. Wear your heaviest items and add layers: for this trip, that was my converse, trousers and cardigan, and I layered in a peplum top and jersey shirt. Travelling outfit: chinos, cardigan, peplum top, lightweight jersey shirt, converse, messenger bag. Dresses: 5 cotton/polycotton, 1 viscose, 2 jersey (this was my unpared down section as I had to take all my me-mades!). A mix of beach/pool, casual and more dressy. 1 pair sandals, 1 pair flip flops. Tops: 1 beaded evening vest, 1 loose fit short sleeved t-shirt, 1 tighter fit short sleeved t-shirt, 1 jersey vest, 1 cotton strappy top. Bottoms: 1 pair navy shorts, 1 pair black shorts, 1 denim skirt, 1 pair navy leggings. 2 leather belts. Other clothing: PJ shorts, vest & socks, swimming costumer, 3 x bikini tops, 2 x bikini bottoms, beach towel. Not pictured: underwear. 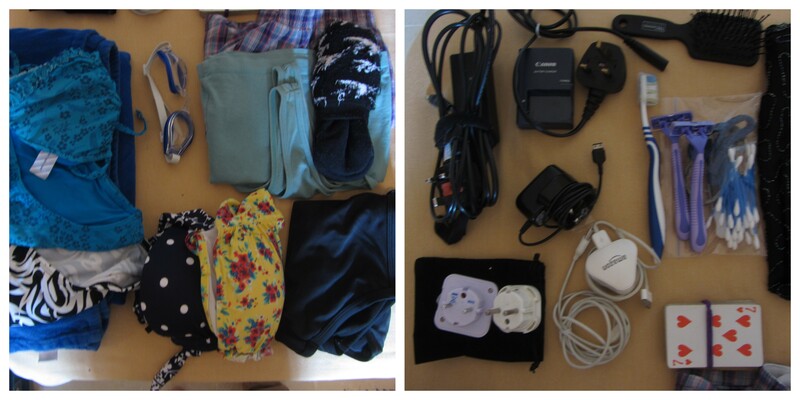 Other items: chargers (netbook, camera battery, phone, kindle, iPod), hairbrush, toothbrush, razors, ziplock bag with cotton buds, hair bands, head band, hair clips & tweezers, playing cards, 2 x plug adapter. Not pictured: fabric shopping bag. Handbag: netbook in neoprene case, kindle & clip on reading light, iPod & headphones, phone, sudoku book, small guide book, tiny notebook, pen, camera in case, sunglasses, 2 x fabric coin purses (for one pounds with bank cards and driving license, one with euros), 1st aid (plasters, antiseptic wipe, painkillers, baby wipes, tissues), plastic wallet with passport, boarding pass & extra euros, ziploc bag with liquids/gels (makeup and sample vial of perfume as I bought toiletries and suncream in Spain as 100ml wouldn’t have been enough). So, how did my clothes taken : clothes worn ratio work out? I didn’t wear the beaded black vest or my white dress, the swimming costume or bed socks, and didn’t use my camera battery or iPod chargers. I could easily have taken less dresses, but with England’s horrible winter weather fast approaching, I wanted one last chance to wear my me-made without loads of layers as well!